…so I could stay longer at the protest. Or I could come back home and ride back on my bike. Feet hurt too much, legs and face were too cold, so we came home. The bus was PACKED…hardly any standing room left going down there. I was hoping it wouldn’t break down. I sat on Stan’s lap to make room for more people boarding. I felt so energized, I wanted to stay longer. I’ll rest up and we can head back again on some weeknight. Not as big a crowd, but we’ve still got to populate the building and get heard. So many people there…it was massive. Lots of good vibes. I hope Stan can find some old silk long underwear I can wear next time so my thighs don’t freeze. Or maybe I’ll wear some pjs underneath my pants. I made another sign that Stan carried like a couple of my recent bumper stickers. I only have two pieces of red clothing, both of which are crew socks, so I wore a pair of those. I need some more red clothing if I’m going to do this more…who knows how long these protests will last. We picked up stray signs and gave them a good home…a couple AFSCME “It’s about freedom” signs we put outside taped over an old lawn sign. So good to see all the support for all workers this has garnered across the nation. It’s OK to FAIL Scotty, now LEAVE! 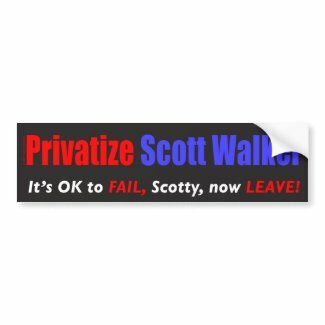 If Scott Walker likes the private sector so much, why doesn’t he just go work there? Bumper Sticker idea by Ann and Stan.